Vedic astrology or Jyotish is based on the Indian or Vedic calendar. The Vedic calendar is a lunar based system. The observances during each month are usually spiritually or religiously based and rooted in deep tradition. One upcoming annual event is Pitru Paksha 2017. September 4 marks the beginning of the time period known as Pitru Paksha (Pitt-true Puck-shuh) , or Shraadh in North America. 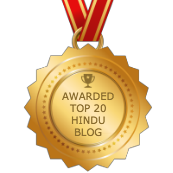 According to mypanchang.com, Pitru Paksha 2017 begins on September 6 in India and concludes on September 20. Pitru Paksha (“the fortnight of the ancestors”) is a period dedicated to honoring our ancestors. This includes our blood relatives as well as significant teachers in our lives. Pitru Paksha 2017 is a time of remembrance and of offering our gratitude. Indians participate in special rituals and rites during this time. Many offer pujas or yajnas (fire rituals) for their departed ancestors, which are performed by Brahmins, or Vedic priests. Offerings are made with black sesame seeds mixed with basmati rice, and ghee. 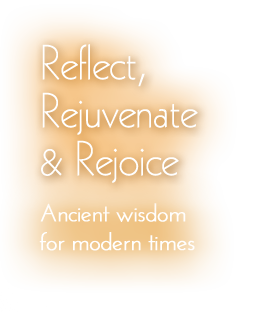 There are specific mantras which are recited during this period. Our ancestors contribute to our karmic legacy and it is important to honor their departed souls. Typically in Vedic astrology, the new Moon each month (amavasya) is also favorable for honoring your ancestors. Pitru Paksha 2017 commences on the first day of the waxing (dark phase) Moon in the Vedic lunar month of Bhadrapada each year. Vedamurti Vivekshastri Godbole elucidates on the importance of Pitru Paksha 2017 in these videos. 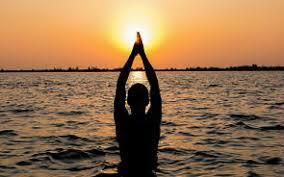 Individuals focus on their spiritual practices and meditation during the entirety of Pitru Paksha. It is typically not a time to commence new ventures or to enter into new agreements. Marriages are also to be avoided. Air travel should also be minimized as much as possible, unless it is for spiritual purposes (i.e. a pilgrimage). Families pay homage to relatives who have passed on and they do so on the specific phase of the moon (the tithi) which coincides with the day that the person left his/ her body. Special meals are also prepared for these days, according to Indian tradition. They include pinda – or rice balls. Offerings are made to ancestors at the bank of a river. 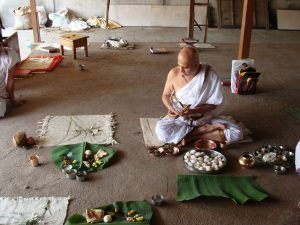 Pitru Paksha puja is done for ancestors who have been departed more than one year ago. For those who have left within the past year, a different type of yajna is performed, to ensure that the soul travels safely on its journey. Regardless of when your ancestor departed the earthly plane, you can do a puja on Mahalaya amavasya. Shri Krishna Yajurveda Pathashala are performing Pitru Paksha pujas for your ancestors. If you would like a Pitru yajna performed in honor of a departed loved one, please sign up online. The festival of Navaratri directly follows Pitru Paksha 2017. These are the nine days celebrating the goddesses Durga, Lakshmi, and Saraswati.